With the Audio-Technica AT-LP60-BT, you can enjoy gorgeous vinyl sound without any speaker wires. With the Audio-Technica AT-LP60-BT, you can enjoy gorgeous vinyl sound without any speaker wires. Just push the turntable's Function button to connect the turntable to your chosen wireless device: your own Bluetooth speakers and Bluetooth headphones can be paired with the turntable and stored in its memory. Or make a wired connection to your stereo system or powered speakers. 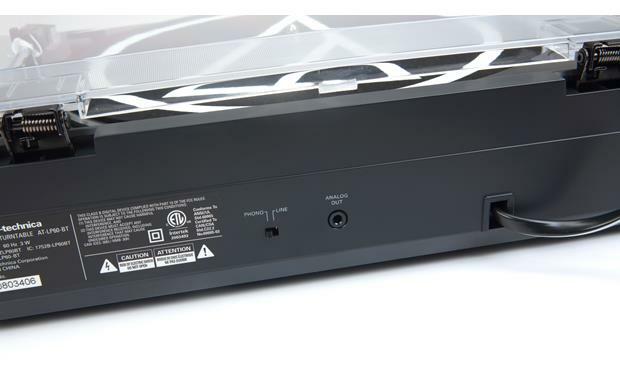 A built-in phono preamp gives you the flexibility to connect to most kinds of home audio systems. Exactly what I wanted it to be....great easy transaction. Is there a way to sync this turntable with a Sonos Playbase and/or 2 Play Ones (all of which I have connected to an LG OLED 55B7A in a surround sound configuration)? Sorry I do not connect the turntable to the place base. I use the turntable with my computer to convert old vinyls to mp3. Built-in Bluetooth (v.3.0) Transmitter: The AT-LP60-BT gives you all the great features of Audio-Technica's popular AT-LP60 fully automatic belt-drive stereo turntable, but with the added convenience of Bluetooth 3.0 wireless connectivity. Thanks to built-in Bluetooth, you can stream your vinyl record audio wirelessly (up to 33') to your Bluetooth enabled speakers, headphones, and other devices. Up to eight different pairs of speakers, headphones or other devices that utilize Bluetooth wireless technology can be stored in the AT-LP60-BT's memory. Once stored, a simple push of the turntable's Function button is all that is required to connect the turntable to your chosen wireless device. 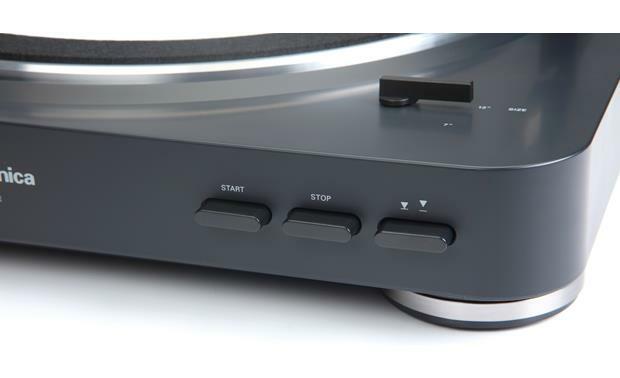 Switchable Built-in Preamplifier: The built-in switchable stereo phono/line-level preamplifier permits use of the AT-LP60-BT turntable with stereo systems having either magnetic-phono inputs or line-level (Aux) inputs; also allows convenient use of the turntable with most powered speakers. 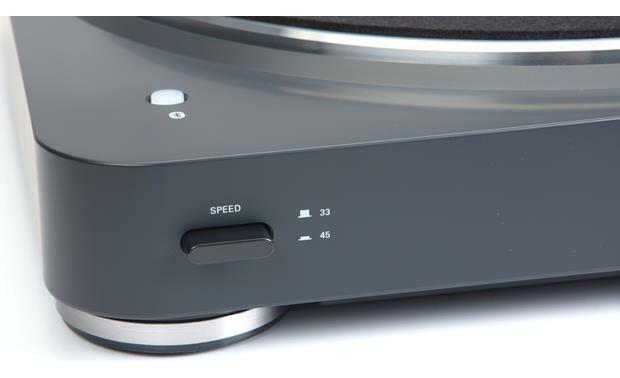 2-Speed Fully Automatic: The Audio-Technica AT-LP60-BT turntable offers fully automatic operation. By gently pushing the Start button the turntable will start while the tonearm automatically moves to lead-in groove. When the record has finished playing, the tone arm automatically will return to the tone arm rest and the turntable will shut off. You can also press the Stop button to stop playback before the record reaches the end and the tone arm will lift and return to the tone arm rest and the turntable will shut off. Two-Speed Operation (33-1/3 & 45RPM): The AT-LP60-BT plays both 33-1/3 and 45 RPM records (comes with a 45 RPM adapter). Dual Magnet Phono Cartridge: The AT-LP60-BT turntable is supplied with an integral Audio-Technica Dual Magnet phono cartridge with replaceable diamond stylus. The cartridge is integrated into the tone arm for assured performance and ease of setup. Die-Cast Aluminum Platter: The Audio-Technica AT-LP60-BT features an anti-resonance, die-cast aluminum turntable platter. The turntable also features a damped lift/cueing mechanism. Stereo Minijack Output: In addition to Bluetooth wireless connectivity, the AT-LP60-BT provides a stereo minijack output and comes with a 39" stereo minijack-to-RCA cable for a wired connection to your home receiver, integrated amplifier, or powered speakers. 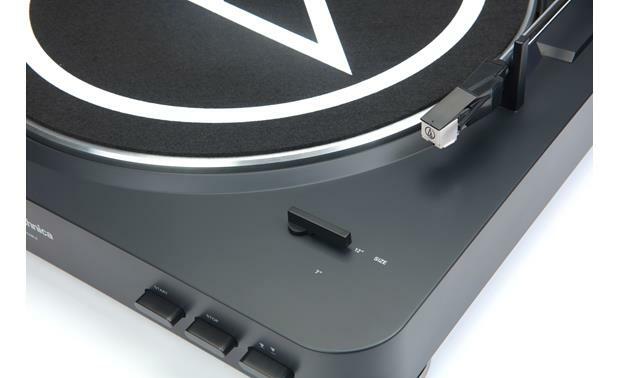 Hinged Dust Cover: The Audio-Technica AT-LP60-BT turntable comes with a hinged dust cover that is also removable. 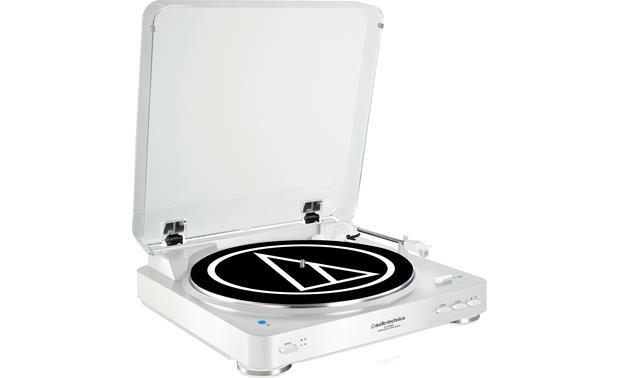 Two Available Colors: The Audio-Technica AT-LP60-BT turntable is available in black or white. IS THE AUDIO TECHNICA LP60 COMPATIBLE with GRADO CARTRIDGES? Yes, but not using bluetooth. You'll need to connect the turntable to a Sonos device w/ a line-in (eg Connect, Connect:AMP, or Play:5). I currently have the HEOS wireless Bluetooth speakers and can this be connected to the speakers without an amp? I'm sorry but I don't know. I can tell you that I was unable to pair the turntable with my laptop and am returning it for an LP3. does this model have bluetooth and usb output? If not, which audio-technica product has both? No, the Audio-Technica AT-LP60-BT does not offer a USB output. They do not currently offer any models with both Bluetooth and the USB output. are there any reviews of this turntable? I see that the 120 has tons of positive reviews, but this less expensive models has none? thanks for any feedback! Do you sell a compatible bluetooth speaker or speakers for the audio technical AT LP60 BT? The AT-LP60WH-BT's built-in Bluetooth transmitter is not proprietary so, it will work with most any Bluetooth enabled speakers or headphones. If I have a bluetooth input to my stereo amplifier, can I connect this player to it - I have no screen or controls on that bluetooth input, it just accepts a signal. Is the record player smart enough to find it and connect? I have tried to use the Bluetooth many times and could not get it to pair. I've had to use a cord to connect it to my stereo. Because it does not have a preamp I have to turn my stereo almost all the way up to hear the music something to think about. Look Jason bought this turn table, was not easy to pair to a Bose loudspeaker, but finally got it working, then I try to pair it to a pair of much more expensive loudspeakers and was impossible therefore I returned it and bought the model that has a wired connection. Better choice at the end, more expensive but direct drive and higher much higher quality. Also from AudioTechina. Do I need to run this turntable through an amp or receiver to get sound from my speakers? I would like to wirelessly connect the turntable to my smart TV's sound bar without going through the amp or receiver. Searches related to the Audio-Technica AT-LP60-BT Fully automatic turntable with built-in phono preamp and wireless Bluetooth® audio output.